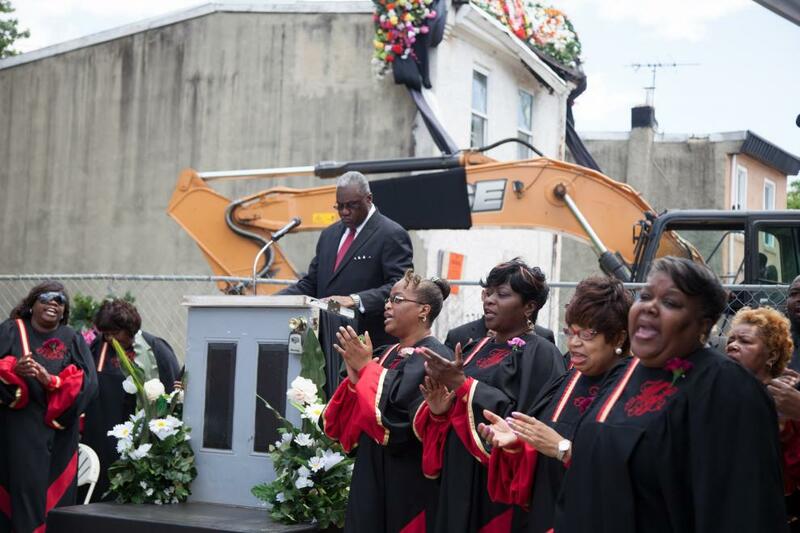 PHILADELPHIA — Every year, nearly 600 homes are demolished in the city of Philadelphia. Each of these households represent a colorful history of family and community, and yet their demise often comes unceremoniously and goes unrecognized. The house at 3711 Melon St. is both a historic object of contemporary significance and a public arena, setting the stage for this unique union of history, community engagement and performative commemoration. 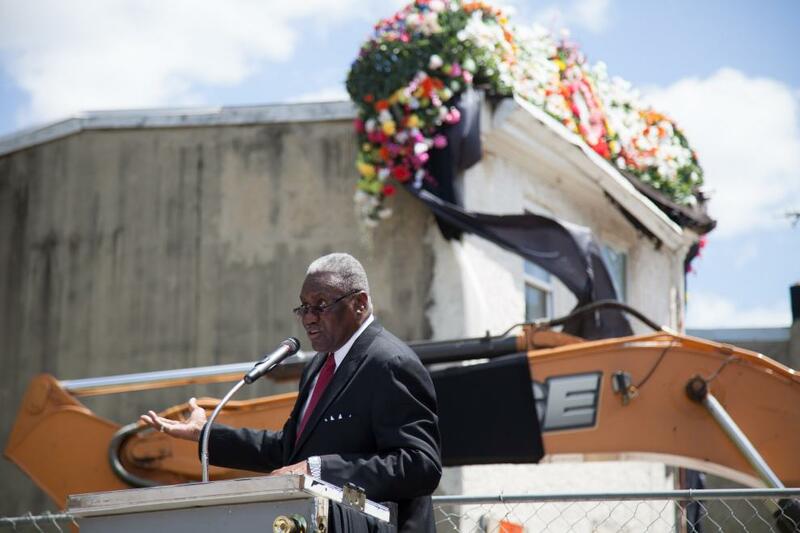 Funeral for a Home is a celebration of the lives the home has touched, including both former residents and current neighbors; a powerful moment of civic pride through memory, song and ritual; and a window into the neighborhood’s nationally recognized potential for redevelopment and revitalization. The idea of a public funeral for an abandoned home was first proposed by photographer and artist Jacob Hellman, formerly of Philadelphia. In 2009, Jacob and a group of friends held a small, informal “ceremony” in the waning days of a home’s demolition in North Philadelphia. In 2012, Temple Contemporary, the exhibitions and public programming department at Temple University’s Tyler School of Art, discovered Hellman’s projectwhile pursuing a shared interest in the surplus and decline of Philadelphia’s housing stock, a topic raised through its Advisory Council. Temple Contemporary initiated conversations with Hellman and the Dufala Brothers to consider ways in which a “funeral for a home” could be explored in a more programmatically ambitious way. The Pew Center for Arts & Heritage funded a 2013 Heritage Grant to Temple Contemporary, a first-time recipient, and in June 2013 major planning was under way. After an exhaustive search for an appropriate home, primarily in the areas of Kensington, Lower North Philadelphia and West Philadelphia, a home was secured at 3711 Melon St., a modest two-story rowhome in the West Philadelphia neighborhood of Mantua. For more information, visit funeralforahome.org. Mantua’s collective energy is palpable, with a strong presence of resident-led community organizations; an ambitious Mantua Transformation Plan just launched in August 2013 under the direction of Mount Vernon Manor Inc. and the Department of Housing and Urban Development; and, most recently, federal designation as a Promise Zone under President Barack Obama’s Promise Zone Initiative. 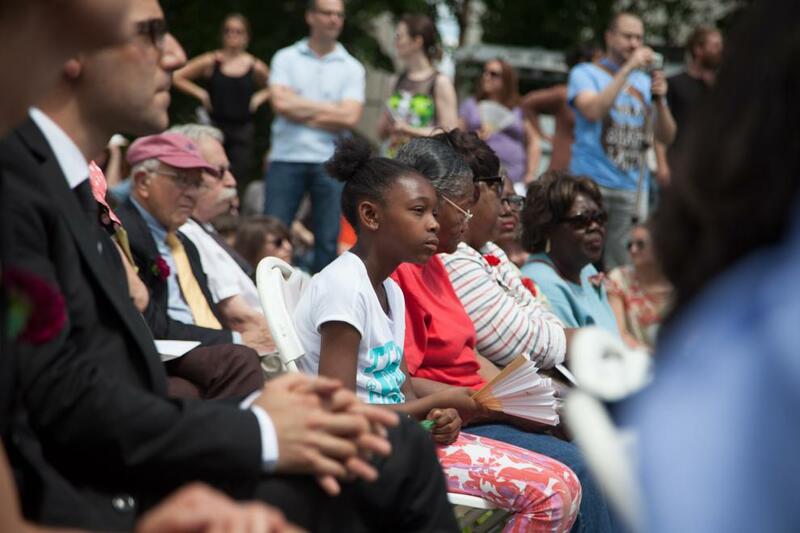 Beyond this neighborhood infrastructure, Mantua’s history offers a rich window into the lives of long-term residents who are proud of its history and are eager to share their thoughts on the neighborhood’s legacy. Mantua’s current and longtime residents are well aware of rising interest in redevelopment, not just in Mantua but also in neighborhoods throughout the city. As residents and community organizations weigh the considerable work of future planning, Funeral for a Home will provide a canvas to express what matters most going forward, and what memories and legacies current residents hold most dear. The culmination of a yearlong project, Funeral for a Home will take place on Saturday, May 31, 11 a.m., at 3711 Melon St. Music, ritual, food and celebration all will be part of this public memorial service designed to commemorate the lives and stories of a modest, vacant rowhome in West Philadelphia’s Mantua neighborhood. Mantua’s Pastor Harry Moore of Mount Olive Baptist Church will lead the service along with the Mount Olive congregation choir. 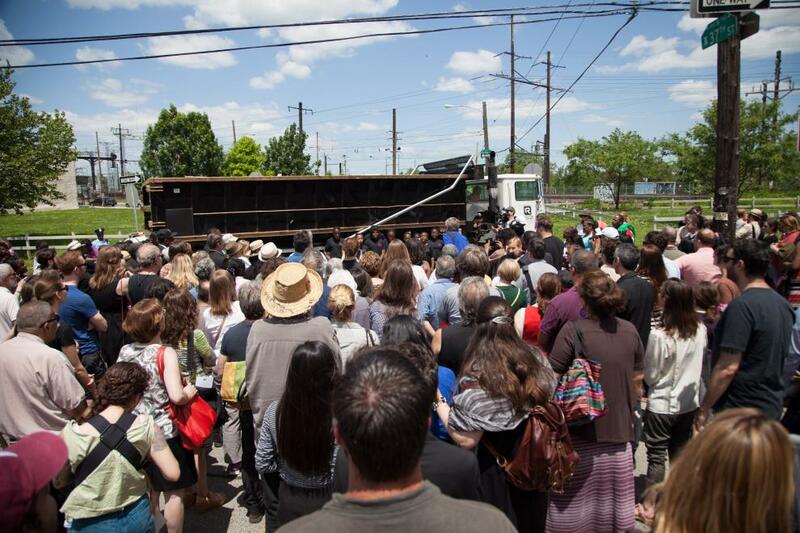 At the service’s conclusion, the home will be demolished and lifted into dumpsters draped in black; a procession will follow the dumpster through the streets of Mantua on its way to Revolution Recovery, a construction and demolition waste recycling facility in North East Philadelphia. The procession will include performances by Play on Philly, local drill teams, Unique Miracles and Xtreme Kre8tionz, and respected voices from the community of Mantua. The procession will wrap back around the 3700 block of Melon Street, at which time everyone will sit down to a family-style meal at a communal table extending the length of the block. Current owner West Philadelphia Real Estate intends to rebuild affordable housing units on the remaining vacant lots. In the interim, between the day’s events and the future groundbreaking, Pennsylvania Horticultural Society will “clean and green” the lots throughout the year. Steven and Billy Dufala are the lead artists on Funeral for a Home. They practice in a variety of media, including sculpture, theater, performance, music, digital media and drawing. For over four years the Dufala Brothers have deliberately housed a portion of their studio practice within Revolution Recovery, a construction and demolition waste recycling facility. Here, the Dufalas select their materials from the hundreds of tons of debris resulting from demolished housing and new construction surplus. Billy also runs the artists residency program RAIR (Recycled Artists in Residence) out of Revolution Recovery. In 2009, the Dufala brothers were awarded the West Grand Prize, an international juried prize in its inaugural year. Most recently, they have exhibited at Fleisher/Ollman as part of the New Wine New Bottle exhibition, and are currently facilitating projects through RAIR as part of ICA@50: Pleasing Artists and Publics since 1963 at the Institute of Contemporary Art, Philadelphia.Both Dufala brothers graduated from the Pennsylvania Academy of the Fine Arts and live and work in Philadelphia. Steven was a founding member of the experimental performative band, Man Man, in which Billy also performed. Billy and Steven Dufala are represented by Fleisher/Ollman Gallery in Philadelphia. Robert Blackson is the project director of Funeral for a Home and the director of Temple Contemporary. Robert Blackson has been the director of Tyler School of Art’s Department of Exhibitions and Public Programs since 2011. In 2012, Blackson became an Andy Warhol Curatorial Fellow. Previously serving as curator of public programs at Nottingham Contemporary, Blackson worked with numerous universities, artists and writers to develop an eclectic and discursive program of lectures, screenings, performances and live events. Prior to joining Nottingham Contemporary, Blackson was curator of BALTIC Center for Contemporary Art, Newcastle/Gateshead, U.K.
Patrick Grossi is the project manager and lead historian for Funeral for a Home. He is a public historian committed to accessibility, thinking seriously about non-traditional methods of engaging the past, and making every effort to allow audiences to place themselves within the historical context of the cities and spaces they inhabit. Grossi is indebted to the foundations of Freeman Tilden’s “Principles of Interpretation,” Michael Frisch’s “Shared Authority” and Dolores Hayden’s “Power of Place.” He has previously worked with the Philadelphia History Museum at the Atwater Kent, Wyck Historic House and Garden, the Preservation Alliance of Greater Philadelphia, the Pennsylvania Horticultural Society and Friends of the Rail Park. In addition to his role with Funeral for a Home, this year Grossi is serving as historical consultant to University of the Arts/DesignPhiladelphia’s ongoing preservation initiative, Gray Area 3 (phillygrayarea.org). With respect to Philadelphia’s historiography, he is most interested in reorienting Philadelphia’s historical narrative away from colonial and antebellum precedents and toward a more modern understanding of the complexities of post-industrial urban life, with special emphasis on the built environment, political processes, and the social and cultural histories of vernacular architecture.